Metabolic syndrome (MS) is a condition described by the group of risk factors associated with obesity that raise the risk of cardiovascular disease (CVD) and type 2 diabetes. These risk factors are: Large waist circumference, high level of triglycerides (TGs), low level of high-density lipoprotein cholesterol (HDL-C), high blood pressure (BP), and high fasting blood glucose levels. MS has become one of the significant public health problem worldwide. Studies showed that MS has an increasing trend in developing countries with change of diet and lifestyle.,,, The significance of detection of MS is to identify individuals at high risk of both type 2 diabetes and CVD. Pathogenesis of MS is complex, but the interaction of obesity, sedentary lifestyle, dietary, and genetic factors are known contributory factors., There is an increase in research towards MS because of the fact that the factors involving are associated with increased morbidity and mortality particularly towards cardiovascular risk. There is little information about the prevalence of MS in working the population in India. Mining being one of the important occupation, which demands strenuous physical activity where in the mine workers have to put in a lot of hard work in their job. It was observed in studies that the obesity is in the rise in the mining population particularly from organized sector. However, there is little information available about the prevalence of MS among mine employees. Hence, the present study was conducted to study the magnitude of MS among different sub occupations in the mining population. The present study was conducted among the mine employees from an organized mining company in the southern India. A total of 357 male mine employees were included in the study. The International Standard Classification of Occupations (ISCO-88) was used to classify the job profile of the mine workers and accordingly group them. ISCO is an International Labour Organization classification structure for organizing information on labor and jobs. It is part of the international family of economic and social classifications of the United Nations. The current version, known as ISCO-88, was published in 2008. The detail of classification of workers into subgroups as per their job profile is shown in [Table 1]. General physical examination along with height in cm and body weight in kilograms was carried out. Body mass index (BMI) was calculated as weight in kilograms divided by squared height in meter (kg/m 2). Arterial BP was measured by using a calibrated mercury sphygmomanometer. The Joint National Committee recommendation was followed for the measurement of arterial hypertension. Study subjects were informed to be on 12 h overnight fast for carrying out various biochemical tests. Of the 357 mine workers, 76 workers were excluded from the study as they did not observe overnight fast. A volume of 5 ml venous blood sample was collected from each study subject and assayed by standard methods for estimation of glucose, total cholesterol, TG, and HDL-C, using a semi-automated analyzer. The blood sugar was analyzed by glucose oxidase peroxidase (GOP-PAP) method, total cholesterol and HDL-C was analyzed by CHOD-PAP method, and TGs by glycerol-3-phosphate oxidase-PAP Trinder method. The LDL-C concentration was calculated by applying the Friedewald equation. Very low-density lipoprotein cholesterol (VLDL-C) was calculated by the indirect method  as VLDL-C is one-fifth of TG level. Following WHO criteria was used for the diagnosis of MS.
Systolic arterial BP ≥ 140 mmHg and diastolic arterial BP ≥ 90 mmHg. Percentage, mean, and standard deviation was calculated. The Chi-square test and P value were used to study the significance of the data. Age wise distribution with respect to sub occupations of mine employees is summarized in [Table 1]. Majority (65.4%) of the mine employees were in the age group of 18–40 years, while 34.5% were in the age group of 41–60 years. 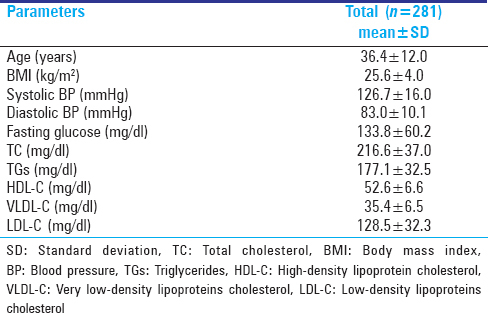 Mean values of the age, BMI, BP and various biochemical parameters are shown in [Table 2]. Individual components and prevalence of MS in different sub occupational groups is shown in [Table 3]. The overall prevalence of MS was found to be 17%. In different occupational groups, the highest prevalence of MS was observed in professional group of 52.9% and lowest in elementary occupations of 9.4%. When the association of MS was compared among the different groups it was found to be statistically significant (P ≤ 0.001). Among the individual MS components, the highest occurrence was of hypertriglyceridemia (80%), followed by diabetes (43.6%), and elevated BP (24.5%). Chi-square analysis revealed statistically significant correlation of the two components, that is, diabetes and hypertension in all occupation groups, while other components were not statistically significant. Occurrence of MS with respect to age is shown in [Table 4]. MS was found to be 6.4% in the 18–30 years f age group, which significantly increased to 40.3% in the 51–60 years age group (P ≤ 0.001). Metabolic syndrome is the silent epidemic of the modern time reflecting the cardiovascular risk attributed to the change of lifestyle. There are many studies depicting the prevalence of MS ranging from 9% to 48% in India.,, Mining is believed to be a tough occupation involving strenuous physical work and hence it can be assumed that the prevalence of MS will be lesser as compared to the normal population. The present study assessed the prevalence of MS among mining group classified as per ISCO-88, in one organized mining company in South India. The overall prevalence of MS was 17% present study shows variability in the prevalence of MS in different sub occupational group and observed that the highest occurrence of MS was in professional group of 52.9% where the stress related to job is higher followed by in clerical group of about 23.3%, the job which requires little physical activity and relatively sedentary in nature. The lowest prevalence was among elementary group of 9.4% where the workers are engaged in moderate physical work. There are very few studies published about MS among occupational groups in India. In one of the study conducted by Nair C V reported the overall prevalence of MS among working population of 18.5%. The occurrence of MS is mainly attributed to the factor like diabetes/impaired fasting glucose levels, hypertriglyceridemia, and hypertension among the professional and clerical groups, which includes the managers, senior officials, and office staff. These findings are similar with other studies in India, which showed the high prevalence of MS in managers and clerical groups. Raised TG level was present among 80% of the employee, which is one of the components of MS. Epidemiological studies have reported a positive relationship between raised serum TG levels and incidence of coronary heart disease. The other MS components present were impaired fasting blood sugar/diabetes in 43.6% employees, elevated BP in 24.5%, obesity (BMI > 30) in 12%, which is a risk factor of dyslipidemia, type 2 diabetes, and hypertension and a strong predictor of coronary heart disease. It was assumed that mining being physical demanding occupation, prevalence of MS will be significantly lower than the general population; however it was observed that the prevalence is in similar line to that of general population with the prevalence of 52.9% among professional group.,, It was also observed that as the age increase the prevalence of MS increases with the prevalence of 40.3% in employees above 50 years. Hence, it is concluded that there is a need of health education and promotion among the mine workers. National Institutes of Health, National Heart and Lung Blood Institute What is the Metabolic Syndrome? Available from: http://www.nhlbi.nih.gov/health/dci/diseases/ms/ms_whatis.html[Last accessed on 2014 Aug 16]. Akinci G, Coskun S, Akinci B, Hekimsoy Z, Bayindir P, Onur E, et al. Atherosclerosis risk factors in children of parents with the metabolic syndrome. Atherosclerosis 2007;194:e165-71. Misra A, Vikram NK. Factors, definitions, predictive value and Asian Indian ethnicity: Complexities of the metabolic syndrome. Indian J Med Res 2008;127:293-6. Sudha V, Radhika G, Mohan V. Current dietary trends in the management of diabetes. Indian J Med Res 2004;120:4-8. Alberti G, Zimmet P, Shaw J. The metabolic syndrome new worldwide definition. J Diabetes 2005;366:1059-62. Nestel P, Lyu R, Low LP, Sheu WH, Nitiyanant W, Saito I, et al. Metabolic syndrome: Recent prevalence in East and Southeast Asian populations. Asia Pac J Clin Nutr 2007;16:362-7. Eapen D, Kalra GL, Merchant N, Arora A, Khan BV. Metabolic syndrome and cardiovascular disease in South Asians. Vasc Health Risk Manag 2009;5:731-43. Gupta A, Gupta R, Sarna M, Rastogi S, Gupta VP, Kothari K. Prevalence of diabetes, impaired fasting glucose and insulin resistance syndrome in an urban Indian population. Diabetes Res Clin Pract 2003;61:69-76. Deepa M, Farooq S, Datta M, Deepa R, Mohan V. Prevalence of metabolic syndrome using WHO, ATPIII and IDF definitions in Asian Indians: The Chennai Urban Rural Epidemiology Study (CURES-34). Diabetes Metab Res Rev 2007;23:127-34.
International Labour Organization. International Standard Classification of Occupations. 2011. Available from: http://www. En.wikipedia.org/wiki/International_Standard_Classification_of_Occupation. [Last accessed on 2014 Aug 16]. World Health Organization (WHO). Report of a WHO Expert Committee 1995 –Physical Status: The Use and Interpretation of Anthropometry. Geneva: WHO; 1995. p. 7. Trinder P. Quantitative determination of glucose using GOP-PAP method. Clin Biochem 1969;6:24-5. Trinder P. Triglyceride estimation by GPO-PAP method. Ann Clin Biochem 1969;6:26-7. Nair CV. Metabolic syndrome: An occupational perspective. Indian J Community Med 2010;35:122-4. Pathania D, Bunger R, Bunger E, Mishra P, Arora A. An epidemiological study of metabolic syndrome in a rural area of Ambala district, Haryana. J Family Community Med 2014;21:130-3. Kanjilal S, Shanker J, Rao VS, Khadrinarasimhaih NB, Mukherjee M, Iyengar SS, et al. Prevalence and component analysis of metabolic syndrome: An Indian atherosclerosis research study perspective. Vasc Health Risk Manag 2008;4:189-97. Taylor H, Liu J, Wilson G, Golden SH, Crook E, Brunson CD, et al. Distinct component profiles and high risk among African Americans with metabolic syndrome: The Jackson Heart Study. Diabetes Care 2008;31:1248-53.